The trend toward smaller, more efficient housing began before the financial crisis of 2008, but the lessons from that rocky period certainly reinforced the movement. Whether you’re empty nesters, on your own for the first time or newly retired, many of today’s new homebuyers are embracing smaller, more affordable house plans. Less interested in resale value, these buyers are focused on planning for the future and staying in their homes. A smaller home is less expensive, far beyond the initial purchase. Right-sized housing is more economical to heat and cool. Electric, water and gas bills are lower, not to mention the taxes. And many earth-friendly homebuyers are interested in shrinking their “carbon footprints.” The amount of greenhouse gases and carbon dioxide emitted by someone is considered a carbon footprint. Tree-hugger or not, most of us understand the backlash toward the conspicuous consumption of the McMansions of the 1990s. Wanting to live simply with less clutter is a common reason for downsizing. Think of how much time it takes to clean and manage a big house. Wouldn’t you love to unburden yourself from all that stuff? Have a yard sale, donate to your local mission or help furnish junior’s new digs. Go ahead, set yourself free. But don’t think you have to give up style, or even luxury, when building smaller and affordably. We’ve gathered three of our favorite small and affordable house plans that are big on style and take advantage of every square foot. Let’s take a look. This single-story, 1,826 sq. ft., 3-bedroom ranch features a bright, open great room with 10 ft. ceilings. The room is flooded with light through front and rear windows and feels much bigger than it is. Built-ins on either side of the fireplace are a must for smaller homes, eliminating the need for furniture pieces. The luxurious foyer off the front porch demonstrates how a smaller home doesn’t have to scrimp on the niceties. Covered porches on both the front and back of the home offer extra living space in warm climates. And for not-so-warm climates, consider a patio heater to give you an extra few months of enjoyment. The private master suite includes a walk-in closet, a must in any house. And the garage includes a workshop area or space for his man cave. 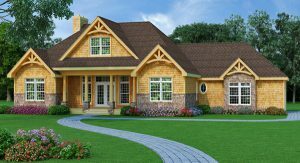 Options for this house plan include a bonus second floor and beautiful walk-out basement with a fourth bedroom, full bath and recreational and media rooms. And as with the other affordable house plans on this page, it has an ENERGY STAR approved option that’ll tell you how to build for efficiency in your location! This 1,500 sq. ft. 3-bedroom, two-story home features a magnificent two-story great room. This room is filled with light and includes a showpiece fireplace. The vaulted master suite offers a grand space to get away from it all. Again, the feel of luxury without all the expense. Notice the second floor washer and dryer space. You can take care of all your laundry without taking the stairs. How convenient! The built-in desk off the dining room is another space saver. Conveniently located next to the pantry, you’ve got a great place to make your grocery list or manage your household. Many use this space as a light office without having to give up a guest bedroom. This house also includes covered front and rear porches to give extra space to read a book or share a chat. This magical 1,421 sq. ft. one-story, 3-bedroom home is big on style with a unique fairy tale porch. Splendid 10 ft. ceilings open up the living areas. Luxury features like a foyer, formal dining room, two fireplaces and deluxe master suite walk-in closet are all included. The island kitchen offers versatility for a space-saving breakfast bar. Double French doors off the family room lead to the picturesque lanai where you’ll find the second fireplace for warm conversations, even on cool nights. The lanai, and covered front and rear porches, increase the living space considerably. And you’ll notice the master suite also has doors to the lanai for the ultimate peaceful retreat. The beautifully detailed detached garage could accommodate extra space for a work out room or office. Options for this house plan include second floor bonus rooms and walk-out basement with two bedrooms, two baths, game room and lanai. As you can see, you don’t have to compromise your lifestyle, or sense of style, when it comes to downsizing. We’ve got lots of big ideas for your new small home. So let’s get started! If you want to live larger in less space, you can find more house plans under 2,000 square feet in our Small House Plan Collection. 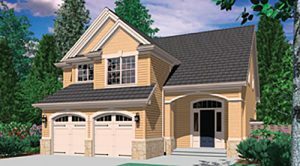 We also offer a collection of Affordable House Plans that takes size and efficiency into account. Please call us at 866-214-2242 so we can help you find the best home for your needs!